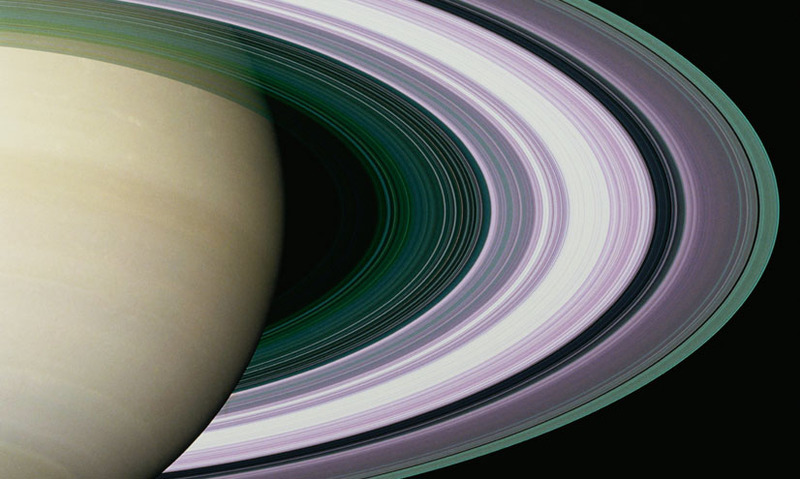 A series of rings surrounding the planet Saturn. A series of rings surrounding the planet Saturn. Though Neptune, Uranus and Jupiter also have ring systems, they are very faint and only Saturn's are visible from Earth. They consist almost entirely of ice, with less than 1% dust or rocky material. There are thousands of rings in total, composed of particles ranging from the microscopic to boulder-sized. Though Neptune, Uranus and Jupiter also have ring systems, they are very faint and only Saturn's are visible from Earth. They consist almost entirely of ice, with less than 1% dust or rocky material. There are thousands of rings in total, composed of particles ranging from the microscopic to boulder-sized.